It was a beautiful day in Kanchanaburi. The morning haze had dispersed from the sky like a dust layer blown from a mirror, and the wind rushing over our skin as we bounced in the bed of the pickup truck rendered the heat tolerable for once. Despite all this, I was apprehensive. We were on our way to Elephants World, a sanctuary that advertised itself as a place where rescued animals were protected and nursed back to health. But I was skeptical. Since writing a recent Outpost Magazine column, wherein I discussed animals being exploited for tourism in developing nations, Thailand’s elephant treks had been prominently on my mind. While elephants bear spiritual significance in Thailand due to Hindu and Buddhist mythology—the country’s national animal is the Thai elephant—they’ve also had practical uses, such as in the lumber industry. When commercial logging was banned in 1989, many of the elephants and their mahouts found themselves unemployed, leading to elephant-based tourism. But performing in shows and catering to tourists isn’t an ideal life for an elephant, and many wound up neglected or abused in unfit conditions. Elephants have free reign at Elephants World in Kanchanaburi, Thailand. Of course, every elephant tour company says their beasts are happy and cared for. I had quietly assumed Elephants World would be just like the rest, and had (perhaps incessantly; certainly shrilly) voiced my concerns to the rest of the Outpost field team in the days prior to the event. As it turned out, I was spectacularly, enormously wrong. Our first pieces of evidence were the grounds themselves—they were lush and lolling, giving the elephants plenty of space to roam and relax. Our interactions with the animals (which had been rescued from logging camps, city begging and tour companies) were respectfully limited. 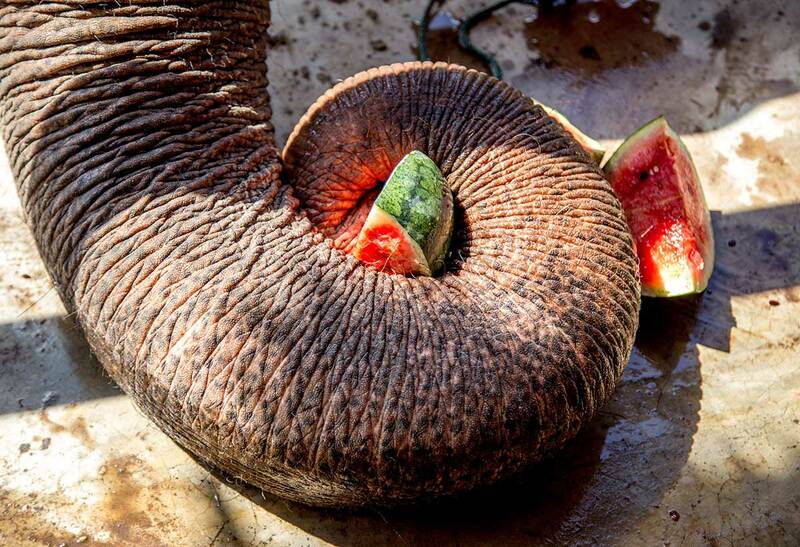 Turns out elephants love watermelon. Who knew? 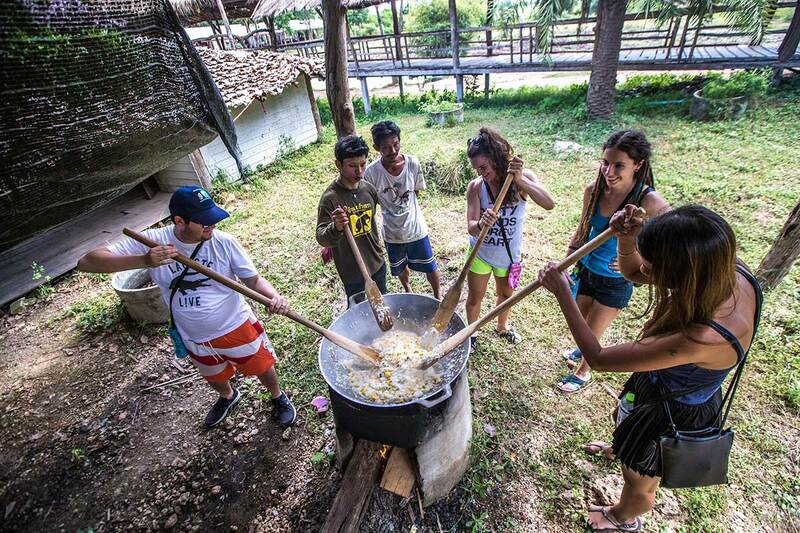 We fed them fruits and veggies, as well as balls of pumpkin, rice and fibre we’d prepared, and scrubbed them with long-handled brushes in the river. We didn’t mount them. Although their mahouts were ubiquitous, the animals weren’t restrained, and it felt as though we were guests in their environment, as opposed to them being awkwardly imposed on ours. This made me admittedly nervous—“They’re like hungry, emotional, amorous Hummers,” I whispered to Lena, leaping backwards whenever a pachyderm noticed my presence—but it also clearly demonstrated who was working for whom. Mashing away at an elephant porridge of pumpkin, fibre and rice. Elephants bury and mourn their dead, suffer from something resembling PTSD, can master basic mathematical skills, craft paintings skillfully, communicate via a complex language, demonstrate high emotional intelligence, show compassion for other creatures and, indeed, have excellent memories. Hence, all captive elephants need to be treated with the compassion equal to that of the staff and volunteers at Elephants World. 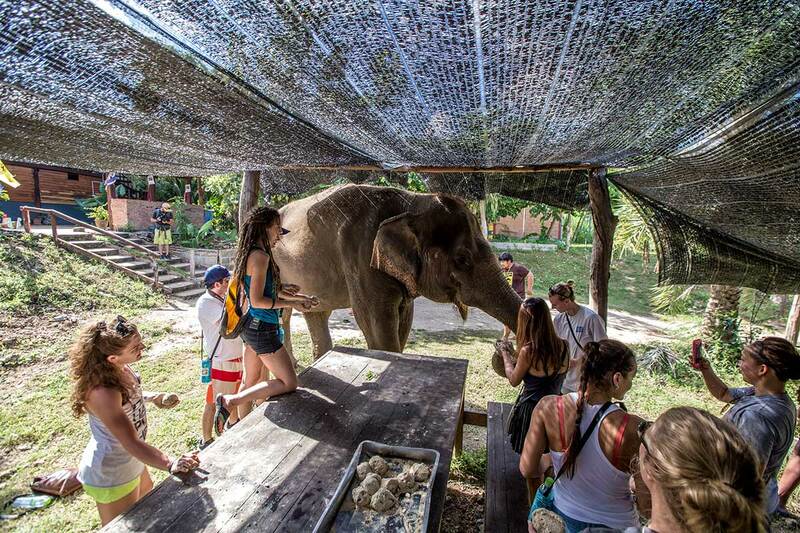 If you’re looking for an ethical elephant experience in Thailand, then this is it.